As stated above, the Doji candle can show trend forward signals as well as trend reversals. For that, you need to use another confirmation beside waiting for the third candle. So, what indicators can be used as the confirmation of this Doji candle? The first Doji candle confirmation that you can use to ensure the direction of trend movement is the Moving Average Convergence Divergence (MACD) indicator. The MACD indicator is used to determine the momentum strength of a trend, so you can predict where the price will move next, whether it will continue (trend continuation) or experience a price reversal. The use of the MACD indicator is marked by two lines EMA (Exponential Moving Average) with 12 (fast length) and 26 (slow length) periods. The space formed by two EMA lines shows the volume on the histogram. The bars on the histogram show the momentum of price momentum in the market. When new trends form in the market, the MACD area on the histogram appears short but getting bigger. The peak trend occurs when market power is fully charged and marked by the MACD histogram bar that appears the longest. Whereas the signs of market momentum began to weaken can be seen from the length of the stem which is getting shorter on the histogram. As the market prepares to switch positions, the MACD area starts to slope and looks smaller. In the end, the histogram pattern will repeat the same cycle in the opposite area. So, how can the MACD indicator be used as a confirmation of the Doji candle? Usually, the Doji candle that appears when the momentum of the MACD indicator strengthens, signifies a reversal. The second Doji candle confirmation is the indicator of the Average Directional Movement Index, or commonly referred to as the ADX indicator. This indicator was made by Welles Wilder to identify trend direction and measure the strength of the current trend. In principle, this indicator shows when the trend starts, how strong the trend is, until when the trend starts to weaken. If you use ADX in trading, the best time for an Entry is when the trend starts, then Exit when the trend is almost over. If + DI cuts -DI from the bottom up and a Doji candle appears, it indicates an Uptrend will occur. If –DI cuts + DI from the bottom up and the Doji candle appears, then it indicates a Downtrend will occur. Although in practice this indicator includes lagging or is slow in anticipating price movements, it is still reliable and quite effective if you are accustomed to using it. In the chart below, it can be seen that the crossing of the -DI and + DI lines coincides with the appearance of the Doji candle which indicates bullish reversal. Specifically, the Support line is generally placed near the lowest price during a certain period, while the Resistance line is usually drawn near the highest price for certain periods. This Support and Resistance point is considered important in trading as "signs", so you know the lowest and highest limits of price movements. In accordance with the Support and Resistance rules, the Support line can change to the Resistance line if the Support point has been successfully penetrated. Conversely, the line Resistance or Downtrend line can change to a Support line if the Resistance point is successfully penetrated. Change of the Support point becomes a Resistance or vice versa, usually marked by the appearance of the Doji candle formation. In short, if you find a Doji candle in a Downtrend condition that breaks the Support point, then it indicates Bearish continuation. While if Doji is found in an Uptrend condition and breaks the Resistance point, the condition confirms the Bullish continuation. 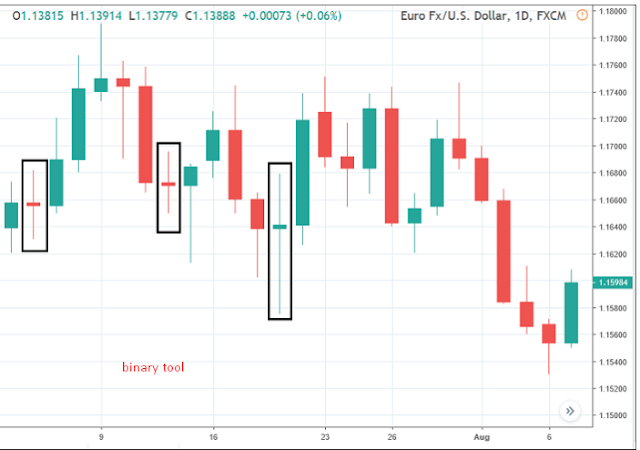 Based on some of the descriptions above, it can be concluded that the Doji candle is able to indicate the trend condition, whether it will continue or a reversal occurs. However, keep in mind once again that the Doji candle shows a consolidation signal. Therefore, to determine the certainty of the direction of the next price movement, you need to add another Doji candle confirmation such as the MACD indicator, ADX indicator, or by determining the Support and Resistance levels.